I have saved a tab containing a search query which includes jenkins-pipeline and jenkins-workflow (with any option set). 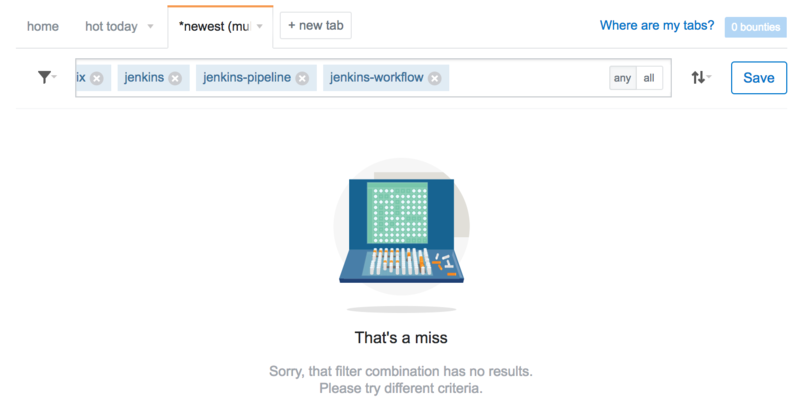 Since the synonym request for jenkins-workflow → jenkins-pipeline was recently approved, my stored tab does not show any results. into the search field, the synonym jenkins-workflow is automatically dropped and results for jenkins-pipeline are shown. This does not happen for saved tabs. Browse other questions tagged bug tag-synonyms new-nav . Why is [mvp] a master tag and [mvc] only a synonym?